Delicious Fall Recipe to enjoy this season. 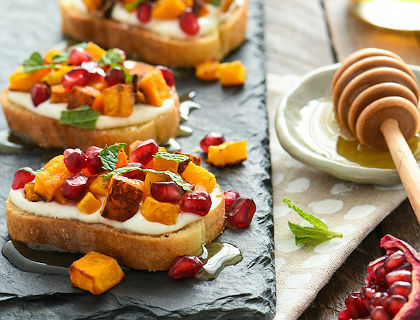 Try the delicious Butternut Squash and Pomegranate Crostini with Whipped Feta and Honey recipe drizzled with Manuka Honey. Preheat oven to 350 degrees spray two rimmed baking pans with cooking spray. Place baguette slices on one prepared pan; lightly spray with cooking spray. Place squash on other prepared pan; lightly spray with cooking spray. Transfer both pans to oven; bake bread 8 to 10 minutes or until crisp (turning once), and squash 20 to 25 minutes or until golden brown and tender (stirring once). Allow bread and squash to cool before assembling crostini. Based on a Recipe from the National Honey Board.